Eric and Sookie are seen here in bed together... naked! 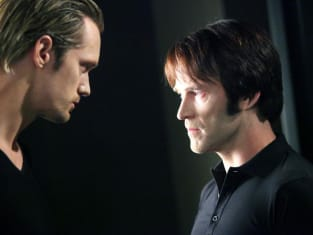 It's a shot from the episode "I Will Rise Up." Hoyt decides to introduce Jessica to his mother over a friendly dinner at Merlotte's. Yeah, I bet you can imagine how smooth this dinner goes. Oh crazy Maryann went from just a little nutty to full on bat$%@! 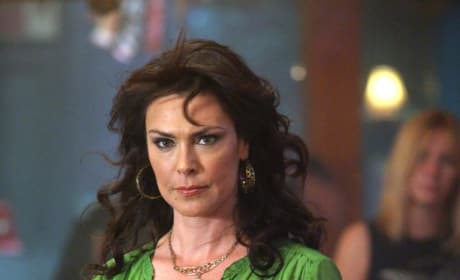 crazy last night when she went into Merlotte's looking for Sam. 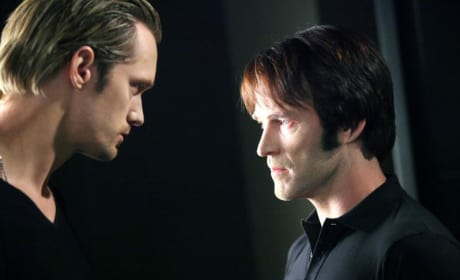 Bill stands up to Eric after he tricks Sookie into sucking his blood. A very angry Bill even throws a punch at the much taller, more powerful vampire. Godric: Father, brother, son... Let me go. Eric: I won't let you die alone. Permalink: Father, brother, son... Let me go. I won't let you die alone.